Contact: Daryl Kimball, Executive Director, 202-463-8270 x107; Kelsey Davenport, Director for Nonproliferation Policy, 202-463-8270 x102. In July 2012, Syria publicly acknowledged that it possesses chemical weapons. For a number of years preceding this announcement, the U.S. intelligence community assessed that Syria has a stockpile of chemical weapons, including blister agents such as mustard gas, and nerve agents such as sarin and VX. Syria has the capability to deliver these agents using aerial bombs, ballistic missiles, and artillery rockets. An Organisation for the Prohibition of Chemical Weapons-UN joint investigative team found Syria and the Islamic State responsible for numerous chemical weapons attacks in Syria over the past several years. Below is a timeline of significant events related to Syria’s chemical weapons program from July 2012 to the present. December 23, 2012: The first allegation of chemical weapons use was reported. Seven people were allegedly killed in Homs by a “poisonous gas” used by the Assad regime. The coverage included the report of side effects such as nausea, relaxed muscles, blurred vision, and breathing difficulties. January 15, 2013: A secret State Department cable from the U.S. consul general in Istanbul said there was compelling evidence that the Syrian military had used a chemical weapon known as Agent 15 in Homs on December 23, 2012. January 16, 2013: Tommy Vietor, a spokesman for the National Security Council, said that the alleged incident of chemical weapons use in December was not consistent with information that the White House has about Syria’s chemical weapons program. March 19, 2013: Alleged chemical weapons attacks were reported in Syria’s two main cities, the Khan al-Assel neighborhood of Aleppo and the Damascus suburb of al-Atebeh. About 25 people reportedly were killed and dozens more injured. The Assad regime claimed that Syrian opposition forces used chemical weapons in the fighting there. March 20, 2013: The Syrian government requested the United Nations conduct an investigation of the March 19 attack on Aleppo, claiming that opposition forces used chemical weapons and killed 25 people. President Obama said in a press conference with Israeli Prime Minister Netanyahu that “the use of chemical weapons is a game changer,” in Syria. March 21, 2013: UN Secretary-General Ban Ki-moon announced the United Nations will conduct an investigation on the possible use of chemical weapons in Syria, in conjunction with the World Health Organization (WHO) and the Organisation for the Prohibition of Chemical Weapons (OPCW). Prior to the announcement, France and the United Kingdom sent letters to the Secretary-General, calling for investigations into three alleged incidents of the use of chemical weapons in Syria. March 24, 2013: Syrian opposition activists reported that Syrian forces used chemical weapons from multiple rocket launchers at the town of Adra, northeast of Damascus, alleging two deaths and 23 injuries. Doctors described that the weapons used were phosphorus bombs that harm the nervous system and induce imbalance and loss of consciousness. April 13, 2013: Syrian Observatory for Human Rights (SOHR) said that the Syrian army dropped two gas bombs on rebel-controlled Aleppo, killing two people and wounding 12. Opponents of the Syrian government accused the army of using chemical weapons. April 17, 2013: UN Secretary-General Ban Ki-moon stated that Syria has impeded the UN investigation by failing to agree to the scope of the UN inquiry on chemical weapons use. April 25, 2013: A letter sent to Sens. Carl Levin (D-Mich.) and John McCain (R-Ariz.) from the U.S. intelligence community said that the Assad regime may have used the nerve agent sarin “on a small scale” in Syria, but that the United States needs more evidence to provide “some degree of certainty” for any decision-making on further action. The letter also said that the Assad regime maintains custody of the chemical weapons in Syria. April 26, 2013: President Obama remarked that the United States and the international community will work together to gain “strong evidence” of the Assad regime’s use of chemical weapons. April 29, 2013: A helicopter dropped canisters allegedly containing chemical weapons on the town of Saraqeb. Eight people claimed symptoms such as nausea and breathing problems, and one of them later died. June 4, 2013: French Foreign Minister Laurent Fabius asserted that there was “no doubt” that the Syrian regime used sarin in multiple cases. Fabius said that the French government confirmed the use of sarin by testing specimen taken from Syria. A UN report also said that there are “reasonable grounds” to have confidence in Syria’s use of chemical weapons four times in March and April, although the report cannot specify the chemical agents or verify who used them. June 13, 2013: The White House said that the U.S. intelligence community has “high confidence” that the Assad regime attacked opposition forces by using chemical weapons multiple times over the past year. In the statement, Ben Rhodes, deputy national security adviser for strategic communications, said that physiological samples from multiple sources show exposure to chemical weapons. The evidence of use is recognized as “credible” in the statement. August 14, 2013: Assad agreed to allow the UN inspection team into Syria to investigate three possible uses of chemical weapons. The team’s mandate only allows it to establish whether or not chemical weapons were used, not who used them. August 21, 2013: Syrian opposition activists claimed that a large-scale chemical weapons attack occurred at the suburbs of the Ghouta region, where Syrian forces had been attempting to expel rebel force. Reports said that thousands of victims of the attack have been counted in the Damascus suburbs, whose symptoms were typically body convulsion, forming from mouths, blurry vision and suffocation. Although the number of victims has not been clarified yet, it is estimated to exceed 1,000 people, many of whom were non-combatant. The United Nations Security Council also held an emergency meeting regarding the attack. The meeting produced a statement demanding further clarity of the incident. August 23, 2013: UN Secretary-General Ban Ki-moon’s spokesperson expressed the intention of the UN to conduct “a thorough, impartial and prompt investigation” on the alleged chemical weapons attack in Syria on August 21. The OPCW Director General, Ambassador Ahmet Üzümcü, expressed grave concerns about the latest attack in Syria, and said that the OPCW experts were already in Syria with the UN investigation team. August 25, 2013: The Syrian regime announced that it will let the UN inspection team investigating past incidents of chemical weapons use visit the Damascus sites in the following days. August 26, 2013: The U.S. Secretary of State John Kerry said in his press briefing that all information the U.S. has, including reports of the number of victims, their symptoms, and the firsthand accounts from humanitarian organizations, strongly indicate that chemical weapons were used in Syria. He also said that Syria attempted to cover-up the incident in the days following the attack. Syrian President Bashar Assad announced that his army did not use chemical weapons in the August 21 attack in Damascus. Assad recognized the allegation of his use of chemical weapons as “politically motivated," in his meeting with Russia's Izvestia daily. A convoy transporting the UN investigation team of chemical weapons was attacked by snipers in Syria. No UN personnel were injured, but they were unable to visit all of the sites affected by the attack. August 28, 2013: The United States has concluded that the Assad regime conducted chemical weapons attacks against civilians, President Obama said in “PBS NewsHour.” Obama said he had not yet made a decision whether to take a military action in Syria. A second UN Security Council meeting was held. August 29, 2013: The British Parliament voted against supporting military action in Syria. Before the vote, a report from the Joint Intelligence Committee released a report which stated that chemical weapons were used in the August 21 attach, and that it was "highly likely" that the Assad regime was responsible. August 30, 2013: The White House released the U.S. Government Assessment on the use of chemical weapons in Syria on August 21. The report says that the intelligence community has "high confidence" that the Syrian government used chemical weapons against the opposition elements in Damascus. Secretary Kerry, in an address, also said that the regime used chemical weapons "multiple times" over the past year. Kerry said discussions on military action are underway. 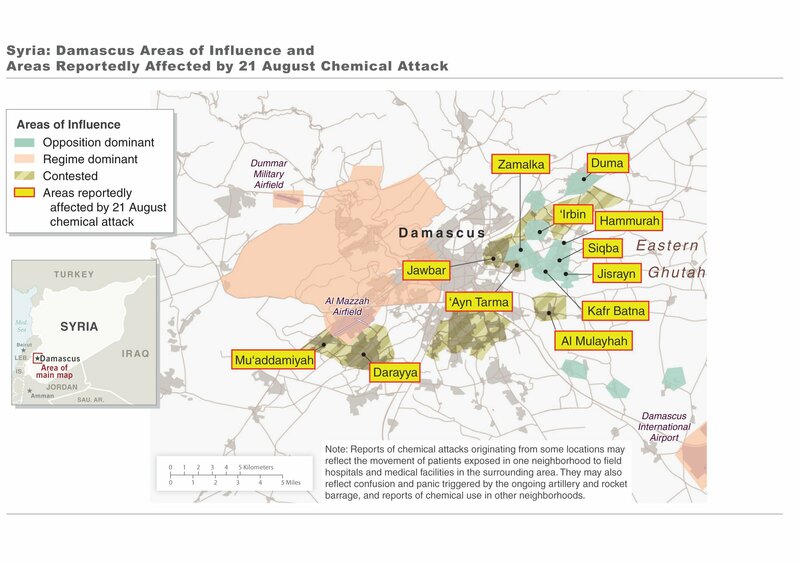 The U.S. Government Assessment included this map of Damascus and the areas impacted by the alleged August 21 chemical weapons attack. August 31, 2013: President Obama made a statement saying that he would seek an authorization for the use of force from Congress for a limited military strike in Syria. Given the evidence of chemical weapons use by the Assad regime in the August 21 attack, Obama said he supported limited action in order to deter further chemical weapons use and uphold international norms. September 2, 2013: France released its declassified intelligence assessment, which concluded that the Assad regime used Sarin gas in the August 21 attack, and in two earlier attacks in April. The report also said France assessed that the use of chemical weapons by the Assad regime violated the 1925 Geneva Protocol. September 9, 2013: Russian Foreign Minister Sergey Lavrov announced a Russian proposition whereby Syria would agree to place its chemical weapons under international control and dismantle them and the United States would agree not to conduct a military strike on the country. Prior to the Russian announcement, Secretary of State Kerry, speaking in the United Kingdom, suggested that if the Assad regime turned over all of its chemical weapons to the international community "without delay", a military strike could be averted. Speaking to media outlets after Secretary Kerry, President Barack Obama said that the United States would consider the plan. September 10, 2013: Syrian Foreign Minister Walid al-Moallem said that the Assad regime welcomed discussion on Russia's plan to give up Syria's chemical weapons and join the Chemical Weapons Convention. President Barack Obama, French President Francois Hollande, and British Prime Minister David Cameron discussed how to implement the plan through the UN Security Council, with France beginning to draft a resolution based on the Russian proposal, but with stipulations that force be authorized if Assad fails to implement the provisions of the resolution. President Obama, in an address to the nation, also requested that Congress postpone a vote on the use of force while the diplomatic path proposed by the Russians is pursued in the UN Security Council. However, he also reiterated his commitment to pursue military action if a deal on securing Syria's chemical weapons is not reached. September 12, 2013: The Assad regime sent a letter to the United Nations Secretary General which said that Assad signed a legislative decree providing the accession of Syria to the Chemical Weapons Convention. In the letter, Assad said Syria would observe its CWC obligations immediately, as opposed to 30 days from the date of accession, as stipulated in the treaty. In Geneva, Secretary of State John Kerry met with his Russian counterpart, Foreign Minister Sergey Lavrov, to begin discussions of the Russian proposal for securing the Assad regime's chemical weapons. September 14, 2013: U.S. Secretary of State John Kerry and Russian Foreign Minister Sergey Lavrov reached an agreement on a detailed plan for the accounting, inspection, control, and elimination of Syria’s chemical weapons. The plan requires Syria to provide a full declaration of its stockpile “within a week” and provide the OPCW and the UN access to all chemical weapons sites in Syria. The plan calls for the OPCW inspectors to complete their initial inspections by November and calls for the destruction of the stockpile of chemical weapons and chemical agents by the first half of 2014. The United States and Russia secured approval of the plan by the OPCW executive council and then a UN Security Council resolution. The agreement outlined states that “in the event of non-compliance, including unauthorized transfer, or any use of chemical weapons by anyone in Syria, the UN Security Council should impose measures under Chapter VII of the UN Charter. September 16, 2013: UN Secretary General Ban Ki Moon delivered a report on the UN investigation into the use of chemical weapons in Syria. The report concluded that chemical weapons were used against on August 21 on a "relatively large scale", and that the victims included civilians. The report cited evidence of the nerve agent sarin both in the environment and present in victims of the attack. It was outside of the report's mandate to assign blame for who used the chemical weapons. September 20, 2013: In accordance with the terms of the agreement negotiated by the United States and Russia, Syria submitted a declaration of its stockpiles of chemical weapons to the OPCW. September 27, 2013: The Executive Council of the OPCW adopted a timeline for destroying Syria's chemical weapons. Hours later, the United Nations Security Council unanimously voted to adopt a resolution that endorses the OPCW timeline for destroying Syria’s chemical weapons arsenal. The Security Council Resolution says that the body will impose measures under Chapter VII of its charter if Syria does not comply with the resolution, or uses or authorizes the transfer of any chemical agents. October 1, 2013: A joint team of OPCW and UN officials arrived in Syria to begin destruction of the country's chemical weapons stockpiles and facilities. October 6, 2013: Officials from the OPCW and UN team said that destruction of Syria's stockpiles of chemical weapons began. The officials confirmed that the Syrians will actually complete the destruction work, while the UN and OPCW team will monitor and verify the activities. October 27, 2013: Syria submitted the details of its plans for "total and verified destruction" of its chemical weapons stockpile and production facilities to the OPCW. This declaration follows an initial declaration submitted on Sept. 20. October 31, 2013: The OPCW confirmed that Syria destroyed, or rendered inoperable, all of its declared facilities for mixing and producing chemical weapons. The OPCW was able to inspect 21 of the 23 sites where these facilities were housed. The remaining two sites could not be visited due to security concerns, but inspectors said that the equipment was moved out of these sites and destroyed. November 15, 2013: The OPCW Executive Council approved a plan for the elimination of Syria's stockpile of chemical weapons. The plan call for transporting the weapons outside of Syria and destruction of the chemical agents in a country that has yet to be identified. The "most critical" chemicals are to be transported out of Syria by December 31, 2013 and the remainder by February 5, 2014. The plan calls for the destruction no later than June 30, 2014, and the destruction of certain priority chemicals by March 15, 2014. The Executive Council also announced that the OPCW was able to verify that 60 percent of Syrian declared, unfilled, munitions for chemical weapons delivery had been destroyed. Syria committed to destroying all of its unfilled munitions by January 31, 2014. November 30, 2013: The OPCW announced that Syria's chemical weapons will be destroyed on a U.S. ship using hydrolysis. Hydrolysis is a process that breaks down chemical agents using hot water and other compounds to neutralize the agents. December 12, 2013: The UN team led by Ake Sellstrom investigating incidents of chemical weapons use in Syria issued its final report to UN Secretary-General Ban Ki Moon. The report found that chemical weapons were likely used in five of the seven attacks investigated. The nerve agent sarin was likely used in four of the attacks, one of which was the large scale attack on a Damascus suburb in August. December 31, 2013: Syria missed the deadline for sending all of its chemical weapons out of the country. This deadline was set by a UN Security Council Resolution approved in September. January 7, 2014: Syria delivered the first load of chemical weapons to its port city Latakia. The chemical weapons were then loaded on a Danish ship that sailed out into international waters. China and Russia are providing protection for the ship, which will eventually transfer the cargo to the US ship, the MV Cape Ray, to be neutralized using hydrolysis. January 9, 2014: The German government announced its willingness to assist in the disposal of the chemical waste byproduct that will be created from the hydrolysis process. 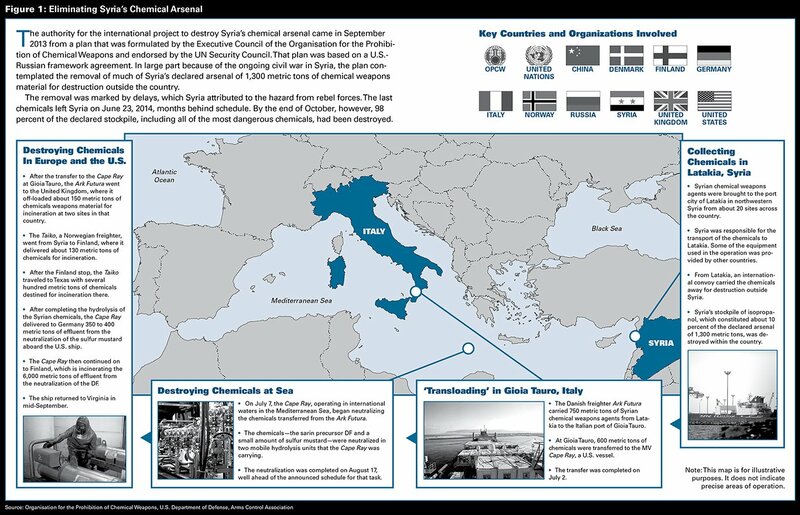 January 16, 2014: Italian Transport Minister Maurizio Lupi said that Gioa Tauro, a port in southern Italy, will be used to transfer Syrian chemical weapons to the US ship, the Cape Ray, that will neutralize the chemicals using hydrolysis. January 27, 2014: A second shipment of Syrian chemical weapons was loaded onto Danish and Norwegian ships at the Syrian port of Lattakia. The U.S. ship that will receive the chemical weapons and then neutralize them using hydrolysis, the Cape Ray, left port. The chemicals will be transferred to the Cape Ray at the Italian port Gioa Tauro. February 6, 2014: Sigrid Kaag, head of the UN/OPCW mission for destruction of Syria's chemical weapons, addressed the UN Security Council a day after Syria missed a second deadline for handing over its critical chemicals and said that she did not believe that the Assad regime was deliberately stalling the removal process. However, she urged Syria to speed up the shipments in order to meet the destruction deadline of June 30. February 10, 2014: A third shipment of Syrian chemical weapons was loaded on a Norwegian cargo ship. In total, 11 percent of Syria's chemical weapons were shipped out of Syria. February 14, 2014: The OPCW announced that two companies, one in Finland (Ekokem OY AB) and one in Texas (Veolia), were awarded contracts to dispose of the effluent created during the destruction of Syria's chemical weapons. February 21, 2014: The OPCW executive committed met to consider the Assad regime's new proposal for shipping out its chemical weapons. After failing to meet a Feb. 5 deadline to remove all of its chemical weapons and precursor chemicals out of the country, the regime proposed a 100 day extension. The OPCW executive committee, however, said that it can be accomplished more quickly. The 100 day extension also will not allow the Cape Ray enough time to destroy the chemical weapons by the June 30 UN Security Council deadline. February 25, 2014: The Assad regime delivered a shipment of mustard gas to the Syrian port of Latakia to be loaded onto ships. March 4, 2014: The Assad regime submitted a revised proposal to remove its chemical weapons from Syria by the end of April 2014. Two additional shipments of chemical weapons also reached the port of Latakia and were loaded onto ships. In total, more than 35% of the country's chemical weapons have been removed. March 7, 2014: The Executive Council concluded its 75th Session and noted in its report the “increasing pace” of removal of Syria’s chemical stockpile and requested the Syria continue “systematic, predictable and substantial movements” to complete the shipments. Another shipment of priority 1 chemicals was reached the port of Latakia, bringing the total amount of chemical agents removed from Syria to 29 percent of the total stockpile. March 19, 2014: The OPCW said that two additional shipments of Priority 1 and Priority 2 chemicals were delivered to the port of Latakia and loaded onto cargo vessels during the past week. Syria has now shipped out more than 45 percent of its stockpile. April 4, 2014: The 12th shipment of Syrian chemical weapons reached the port of Latakia, according to the OPCW. April 11, 2014: Reports emerged of an attack using chlorine-gas bombs in Kafr Zita, a village controlled by opposition forces in northwestern Syria. April 14, 2014: The Syrian government delivered its 13th consignment of chemicals to Latakia, which was removed today from the port on cargo ships. As of this delivery, the OPCW said that the Assad regime has shipped out 65 percent of its total stockpile of chemical weapons, including 57 percent of the Priority 1 chemicals. April 18, 2014: Additional shipments of chemical weapons reached the port of Latakia between April 14-18. The OPWC said in an April 18 statement that in total, the 16 shipments constitute about 80 percent of Syria's stockpile of chemical weapons. April 22, 2014: Another shipment reached Latakia port, bringing the total of the chemical weapons stockpile removed from Syria to 86 percent. April 24, 2014: An additional shipment to Latakia brings the total to 92 percent. April 29, 2014: The OPCW announced that it would send a team to investigate the April 11 attacks that the Assad regime used chlorine gas. May 1, 2014: Syria missed the revised deadline to remove all of its chemical weapons stockpile from the country by the end of April. Approximately 8 percent of the stockpile, largely sarin precursor chemicals, remains in Damascus. June 8, 2014: The Norwegian ship Taiko departed for Finland and the United States to deliver Syrian chemical weapons for destruction. June 17, 2014: The OPCW's fact finding mission in Syria to investigate the use of chlorine gas concluded that it was used in earlier attacks. The team was unable to visit all of the locations due security issues. June 23, 2014: OPCW Director General Uzumcu announced that the last 8 percent of Syria's chemical weapons was shipped out of the country from the port of Latakia on the Danish ship Ark Futura. Uzumcu says the chemicals should be destroyed within four months. July 2, 2014: Over 600 metric tons of chemical weapons were loaded on to the Cape Ray at the port of Gioia Tauro in Italy. July 21, 2014: The OPCW announced that all of the chemical weapons have reached the various facilities in Finland, the United States, the United Kingdom, or the Cape Ray for destruction. At the time of the announcement nearly 32 percent of the total stockpiles had been destroyed. July 24, 2014: The executive council of the OPCW also announced that seven hangars in Syria that were part of the country's chemical weapons will be destroyed and five bunkers will be permanently sealed. August 13, 2014: The OPCW announced that 581 metric tonnes of a precursor chemical for sarin gas have been neutralized on the Cape Ray. Operations to neutralize the blister agent sulfur mustard have now begun. August 19, 2014: The Cape Ray completed destruction of 600 metric tons of Syrian chemical weapons and precursor chemicals. The OPCW announced that the ship will now transport the effluent to Finland and Germany for disposal at land-based facilities. September 10, 2014: The OPCW confirmed that chlorine gas is being used in Syria. While the OPCW did not assign blame for the attacks, US Secretary of State John Kerry said that the use of helicopters to drops the chlorine gas "strongly points" to the Assad regime as the perpetrator. March 6, 2015: The UN Security Council adopted a resolution March 6 condemning the use of chlorine as a weapon in Syria’s civil war and threatening action under Chapter VII of the UN Charter if chemical arms are used again. April 16, 2015: Doctors testified at the UN Security Council about recent chlorine gas attacks in Syria. Human Rights Watch estimated that over 200 were killed by recent chlorine attacks. May 8, 2015: Reuters reported that the OPCW confirms traces of sarin and VX gas at a military facility in Syria that were not declared. The samples were taken in December and January. August 7, 2015: Security Council Resolution 2235 was adopted, creating an investigative unit to determine the responsible parties for reported chemical weapons attacks in Syria. November 6, 2015: A press release from the OPCW fact-finding team claimed with "the utmost confidence" that the Islamic State used sulfur mustard in an attack on August 21, 2015 in Marea, in northern Syria. January 4, 2016: The OPCW announced in a press release that the last of the Syrian chemical weapons material, 75 cylinders of hydrogen fluoride, had been destroyed by Veolia Environmental Services Technical Solutions. August 10, 2016: Hospital officials reported a chemical weapons attack using chlorine gas in Aleppo. August 24, 2016: The third report of the OPCW-UN Joint Investigative Mechanism was released, finding that the Syrian government was responsible for chemical weapons attacks in Talmenes in April 2014 and in Sarmin in March 2015. The report found that the Islamic State was responsible for an attack using sulfur mustard in Marea in August 2015. September 7, 2016: Allegations were made that toxic chemicals, likely chlorine gas, were used in Aleppo. October 21, 2016: The OPCW-UN Joint Investigative Mechanism issued a report finding that the Syrian regime was responsible for a third attack using chlorine gas in Idlib province on March 16, 2015. November 11, 2016: The OPCW Executive Council adopted a decision that condemns the use of chemical weapons in Syria and calls upon parties responsible for use, as identified in the OPCW-UN Joint Investigate Mechanism reports, to desist from further attacks using chemicals. The decision called for additional investigations at Syria at sites identified by the UN-OPCW reports and inspection of facilities in Syria. December 13, 2016: Allegations were made that chemical weapons were used in the Islamic State controlled areas of the Hama Governate, northwest of Palmyra. April 4, 2017: Chemical weapons were used in an attack that killed dozens of people in Syria's northern Idlib province. Initial reports suggest the attack used sarin gas, a nerve agent. The attack is believed to have been perpetrated by the Syrian government, due to the type of aircraft in the area at the time. The OPCW announced that it is investigating the reports. Syria denied it was responsible. April 5, 2017: The UN Security Council called an emergency meeting to discuss the chemical weapons attack in Idlib. April 6, 2017: The United States used Tomahawk cruise missiles to target an air base in Syria. The Assad regime is believed to have conducted the April 4 chemical weapons attack from that base. April 11, 2017: The United States released a declassified report that confirmed victims were exposed to sarin in the April 4 attack. April 12, 2017: Russia vetoed a UN Security Council Resolution that condemned the April 4 chemical attack, called upon Syria to provide full access to investigators, and expressed determination to hold perpetrators accountable. Russia said that blame for the April 4 attack was prematurely attributed to the Assad regime. April 19, 2017: The OPCW said there was "incontrovertible" evidence that the April 4 attacks used sarin or a sarin-like substance. June 26, 2017: The White House issued a release saying it identified "possible preparations for another chemical weapons attack by the Assad regime." The statement said that Assad will "pay a heavy price" if he conducts an attack using chemical weapons. U.S. Ambassador to the UN Nikki Haley said in a separate statement that by supporting the Assad regime, Russia and Iran would also be accountable for any further use of chemical weapons. June 30, 2017: The OPCW fact-finding mechanism confirmed that sarin was used in a chemical weapons attack in Khan Sheikhoun on April 4, 2017. October 24, 2017: The UN Security Council failed to adopt a resolution to extend the mandate of the OPCW-UN JIM for another year before it expires on November 17. Eleven members voted in favor of the resolution, China and Kazakhstan abstained and Boliva and Russia voted against it. The resolution did not pass because of Russia's veto. October 26, 2017: The seventh report of the OPCW-UN joint investigative mechanism found the Assad regime guilty of using sarin nerve agent in the April 4 attack in Khan Sheikhoun and the Islamic State responsible for the use of sulfur mustard at Umm Hawsh in September 2016. November 6, 2017: The OPCW Fact-Finding Mission reported that sarin was more than likely used as a chemical weapon on March 30, 2017 in the south of Ltamenah. November 8, 2017: U.S. Secretary of State Rex Tillerson, U.K. Foreign Secretary Boris Johnson, French Foreign Minister Jean-Yves Le Drian and German Foreign Minister Sigmar Gabriel released a joint statement condemning the use of chemical weapons in Syria as described in the seventh JIM report and calling on the UN Security Council to act to continue the investigations. November 16, 2017: The mandate of the OPCW-UN JIM, responsible for determining the culpable actor for chemical weapons attacks in Syria, expired after both resolutions introduced at the UN Security Council to extend it failed. The resolution sponsored by the United States received 11 votes in favor, 2 against and 2 abstentions and failed because Russia vetoed it. The Russian resolution received 4 votes in favor, 7 against and 4 abstentions. November 17, 2017: A UN Security Council resolution introduced by Japan to extend the JIM's mandate for 30 days received 12 votes in favor but failed because of a Russian veto. January 23, 2018: France launched the International Partnership Against Impunity for the Use of Chemical Weapons, a new initiative that seeks to increase information sharing about reported chemical weapons attacks and publically lists individuals and entities sanctioned for their involvement in chemical weapons use. Russia then called a last minute UN Security Council meeting, introducing a new proposal to extend the Joint Investigative Mechanism (JIM). The United States rebuked the proposal on the grounds that it was merely intended as a distraction from the launch of the new partnership. February 1, 2018: The third chemical weapon attack in 2018 in Douma, Damascus is reported. The two earlier attacks were reported on January 13 and January 22. Reports assess that chlorine gas was used in all attacks. At a UN Security Council briefing on February 5, UN High Representative for Disarmament Affairs Izumi Nakamitsu stated that reports from the OPCW Fact-Finding Mission on these alleged attacks are pending. April 7, 2018: Reports surfaced of a major chemical weapons attack in Douma, a suburb outside of Damascus, Syria, killing at least several dozen civilians. This followed smaller chlorine gas attacks that were reported in Douma on March 7 and 11. Human Rights Watch has documented 85 chemical weapons attacks since 2013 in Syria. The OPCW announced that its Fact Finding Mission is investigating the incident to determine which chemical weapons may have been used. April 10, 2018: The UN Security Council voted on three resolutions to address chemical weapons use in Syria. Russia vetoed a U.S.-sponsored resolution which would have created a UN Independent Mechanism of Investigation with a one-year mandate to investigate the responsible actors for chemical weapons use in Syria. A Russian resolution which would have created a similar body but would have allowed the UN Security Council, not the investigative body, to ultimately determine accountability failed to receive enough votes to pass. A second Russian resolution, which urged the OPCW Fact Finding Mission to investigate the incident and offered Russian military protection for investigators, also failed to receive enough votes to pass. The OPCW had already announced earlier that day that it was planning to deploy a Fact-Finding Mission to Douma. April 13, 2018: The UN Security Council met for the fourth time that week to discuss chemical weapons use in Syria. Russia and Bolivia continued to urge the United States against taking unilateral military action as the United States, France and the United Kingdom seemed to make the case for a strike. "Should the United States and our allies decide to act in Syria, it will be in defense of a principle on which we all agree, U.S. UN Ambassador Nikki Haley said. France, the United Kingdom and the United States launched precision strikes on three Syrian chemical weapons facilities. In a televised address to the nation, President Trump explained that the purpose of the strike was to "establish a strong deterrent against the production, spread and use of chemical weapons." He continued "To Iran and Russia, I ask: What kind of a nation wants to be associated with the mass murder of innocent men, women and children?" Syrian state television reported that its air defense system had shot down 13 of the missiles, although the United States later denied that any missiles had been engaged. Russian Ambassador Anatoly Antonov said in a statement shortly after the announcement of the strike: "We warned that such actions will not be left without consequences." April 14, 2018: The OPCW Fact-Finding Mission was in Syria investigating the April 7 chemical weapons attack to verify that the attack occurred and to identify which chemical agent was used. France released its national assessment of the April 7 chemical weapons attack, concluding that "(i) beyond possible doubt, a chemical attack was carried out against civilians at Douma on 7 April 2018; and (ii) that there is no plausible scenario other than that of an attack by Syrian armed forces as part of a wider offensive in the Eastern Ghouta enclave." The UN Security Council met to discuss the situation in Syria. The United Kingdom stated that the legal basis for its joint strike was humanitarian intervention. Russia and Bolivia condemned the strike, which they asserted was a violation of the UN Charter. Russia also introduced a draft resolution which condemned "aggression against the Syrian Arab Republic by the US and its allies," but it only received three votes and failed to pass. France, the United Kingdom and the United States announced their intention to introduce a draft resolution on political and humanitarian tracks to resolve the conflict. April 21, 2018: The OPCW Fact-Finding mission team visited one of the sites in Douma to collect samples for analysis in connection with the April 7 attack. May 16, 2018: The OPCW Fact-Finding mission reported that "chlorine, released from cylinders through mechanical impact, was likely used as a chemical weapon on 4 February 2018 in the Al Talil neighborhood of Saraqib." June 13, 2018: The OPCW Fact-Finding mission reported that sarin was "very likely used as a chemcial weapon" in Ltamenah, Syria on March 24, 2017 and that chlorine was "very likely used as a chemical weapon" at and around Ltamenah Hospital on March 25, 2017. June 27, 2018: A special session of the OPCW conference of states-parties voted to grant the OPCW the mandate to investigate and attribute responsibility for chemical weapons attacks in Syria confirmed by the Fact-Finding Mission. September 12, 2018: The Independent International Commission of Inquiry on the Syrian Arab Republic, established in 2011 by the UN Human Rights Council reported that the Syrian government used chlorine as a weapon four times from January to July 2018. March 1, 2019: The OPCW Fact-Finding Mission released a final report concluding that a toxic chemical, likely chlorine, was used as weapon on April 7, 2018 in Douma, Syria. The OPCW had issued an interim report on the incident in July 2018.